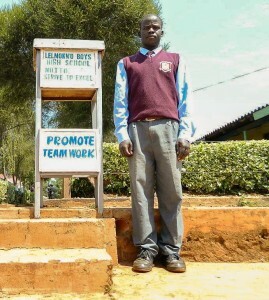 Despite his soft-spoken, calm nature and small physique, he is actually the school captain and he is the link between the students’ body and the administration of Lelmokwo Boys High School. His name is Kennedy Koech. He hails from Kapsabet and was born to a single mother twenty years ago. Kennedy comes from a family of six. His siblings and their mother live together with their grandmother. Coming from an impoverished family and having had a hard childhood did not deter him from working hard at school. Due to his excellent performance in primary school and his appeal for sponsorship, he was awarded a scholarship by the Jomo Kenyatta Foundation. He is currently being sponsored by the foundation to pursue his secondary school education at Lelmokwo Boys High School. He is in fourth form (his fourth year). The school has 800 students and 45 teachers. Kennedy’s favorite subject is physics as he aspires to be an electrical engineer. His favorite sport is rugby. “I love my school but I wish that we had a constant and reliable water source,” says Kennedy. “We mostly depend on rain water and a well that was dug by the school but dries up during the dry season,” adds Kennedy. He says that during such times the school hires people to bring water to the school for cooking but the students have to walk 11/2km to get water for their own personal use and cleaning. He adds that cases of typhoid and diarrhea are very common in the school due to unsafe water. Luckily for Kennedy and his fellow students, the school has already contacted Bridge Water Project and the school will soon be getting a donor funded well. After hearing this news he can’t hide his joy. “If water is readily available in school we will have ample time to study instead of going to the river and water born diseases will be a forgotten story,” he says. With a project like this in his school, Kennedy can only hope for the best. His dream of one day becoming an electrical engineer is clearer and hopes that his hard work at school will one day pave way for him to support his grandmother, siblings and his mother who have really sacrificed a lot for him to be where he is today. When you invest in The Water Project, you're investing in people like Kennedy. Your gifts help us reach more communities with the gift of clean, safe water. And every drop helps unlock potential.